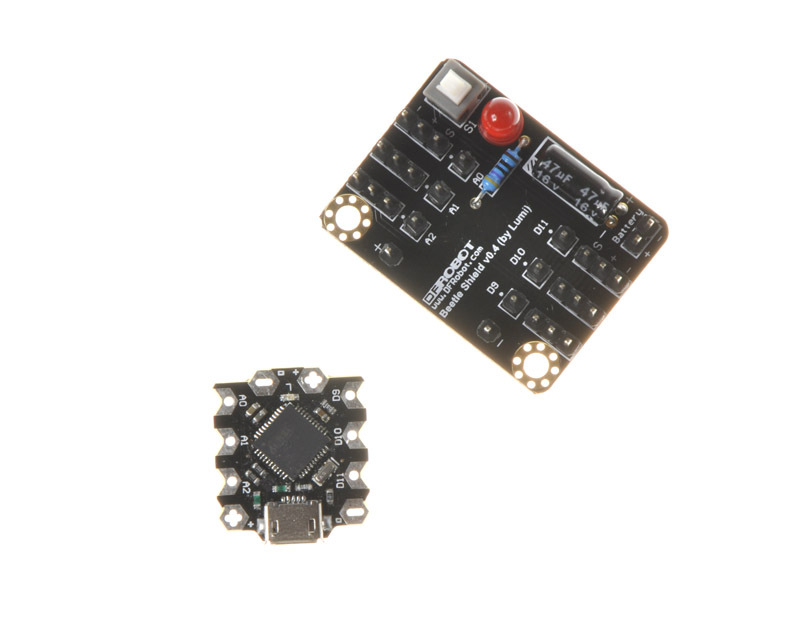 The Beetle shield is designed to attach a Beetle controller for easy connecting servos and sensors. To attach the Beetle to the shield it requires some soldering work. Align the holes of the Beetle with the pins on the shield. 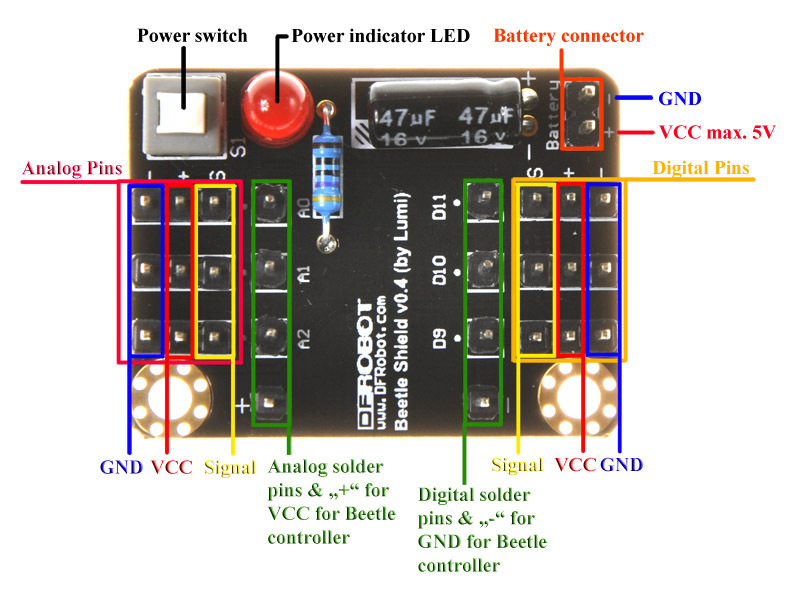 Make sure the Beetle controller is showing the microcontroller chip and the USB socket facing up to ensure the correct polarity and pin assignment after soldering it to the shield. Push the Beetle down onto the pins and let the pins looking out for ca. 1mm. Solder the eight pins at the pads of the Beetle using a soldering iron or soldering gun. 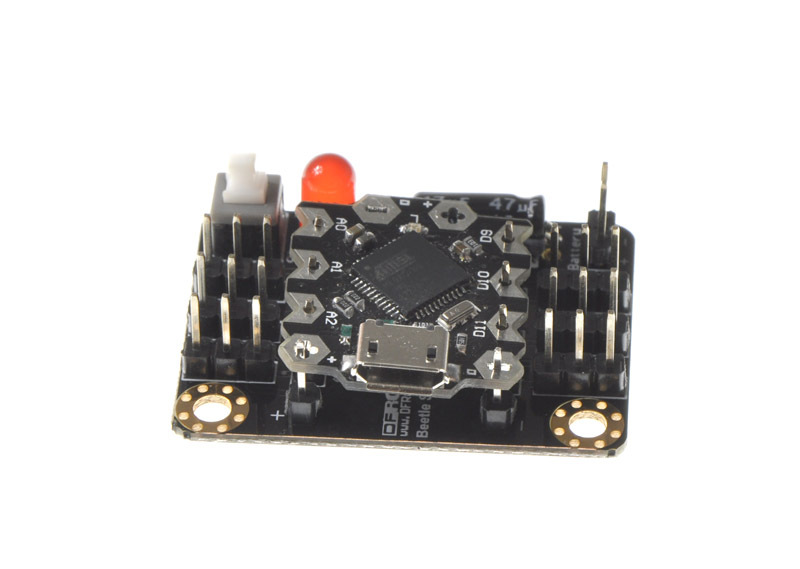 The shield is a breakout of the six pins D9, D10, D11 and A0, A1, A2 as well the two power pins + and – besides the USB socket. The other two power pads on the other side of the Beetle are not connected with the shield but you still can use them as a power source since they are routed to the power lines on the Beetle itself. 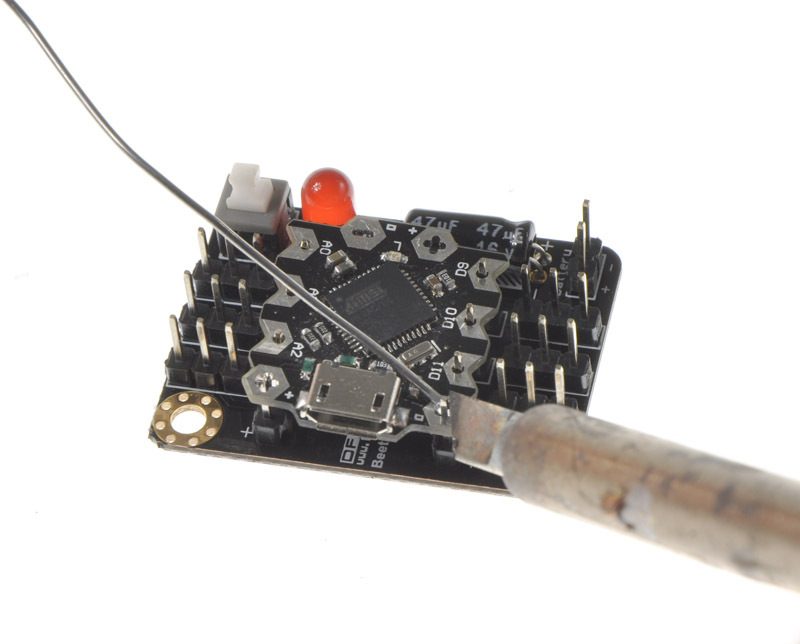 After soldering the Beetle on the shield you may power it up by connecting a power source from 3V to 5V with the power pins labeled with + and - on the Beetle shield. With switching the power on by pressing the button the LED should light up to confirm the power is witched on. At the same time the LED on the Beetle should light up too. That is the proof that you successful finished the soldering task. 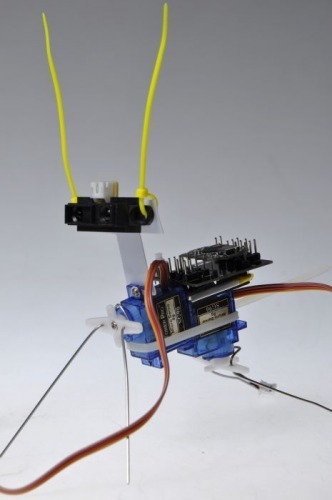 Now you might program your Beetle controller by connecting a Micro USB cable with the USB socket of the Beetle. Note: If you want to use the additional pins (RX, TX, SCL and SDA) broken out to the Pads on the backside of the Beetle controller you might need to solder them before you solder the Beetle to the shield.